The dramatic Twitter re-enactment of the Russian revolution of 1917 is garnering huge attention online, as it recounts the daily events that changed the course of world history 100 years later. RT’s #1917LIVE Twitter project is retelling the fateful events of 1917 Russia through Twitter with special profiles for Tsar Nicholas II, Vladimir Lenin, Empress Alexandra and many others including everyday Russians who were caught up in the tide of history that swept their country. Thank you for the time travel #1917Live. The war to end all wars was fought 100 years ago and #1917Live brought it to life, a fantastic job. The “as it happened” style messages have been winning praise from history enthusiasts all over the world. Several people pointed out that lessons for the current day can be gleaned from the historical retelling. The project has already recounted several key developments as the course of Russian history changed dramatically in early 1917. It has seen a series of expanding strikes and protests as well as street clashes between demonstrators and soldiers that saw dozens of people killed. @RT_1917 can't recommend following this page and its players enough. Truly engaging real time Russian revolution 100 years later. On March 15, Nicholas II was forced to abdicate in favor of his brother, who in turn refused the crown; signaling the end of 300 years of Romanov rule in Russia. La Revolución Rusa, en tuits. Recent updates show how news of the revolution was greeted in newspapers in Europe and America. 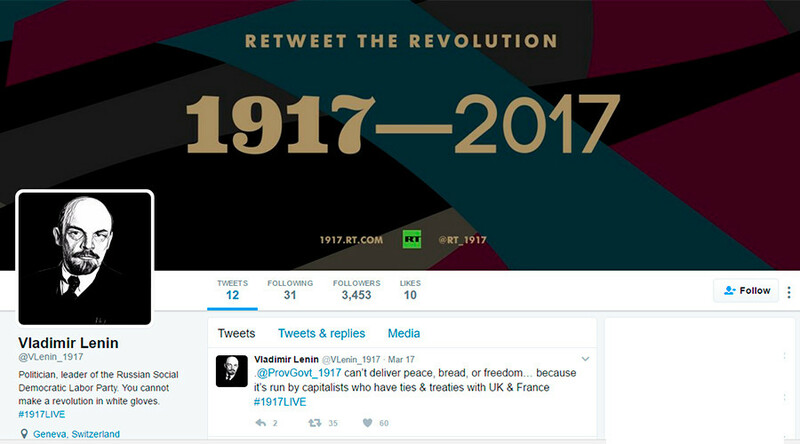 Yes, an RT account, but @RT_1917 is doing some pretty cool stuff live tweeting the 1917 revolution in real time. The project has been described as “incredibly addictive”, “truly engaging” and “the best thing on Twitter”. Anyone is free to get involved in the project by creating a historic Twitter profile and tweeting #1917CROWD. All the relevant figures can be found on this list.